Our Roasted Turkey Gravy Mix is a savory delight that delivers the delicious flavor you love, without the trouble of cooking a bird. Our gravy mix makes comfort foods like our Poutine or Turkey Pot Pie easier to whip up than ever. Roasted Turkey is rated 5.0 out of 5 by 7. Rated 5 out of 5 by Joan from I'll never fuss with gravy again. I used this since we were only having a turkey breast for a small group to supplement the meager amount of drippings. I've had gravy in a jar for leftovers and it's always been a poor substitute for pan gravy. But this was outstanding and with some drippings added I'm sure my repeat guests couldn't tell the difference. Rated 5 out of 5 by Barbara Ann from The best of those I tested! I tested 3 turkey gravy mixes this Thanksgiving. 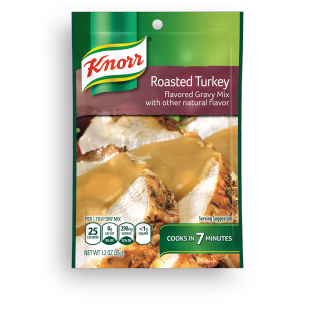 Not only did Knorr beat Durkee and the store brand, but it really really tastes like a gravy that comes from a roasted turkey! Rated 5 out of 5 by Bumbles from Closest to homemade I've ever tasted And I do mean, pretty darn close. If I've roasted some turkey I add the drippings but it's definitely not necessary. This gravy beats any other store bought gravy and restaurant gravy by miles. Loving my hot turkey sandwiches. Rated 5 out of 5 by Maddy from Our favorite gravy! We're a gravy loving family. We've used this gravy for years, especially now that we usually buy ground turkey or turkey breast. It's 'roasted' turkey flavor is wonderful. To our disappointment, our local stores no longer carrys it so we buy it in bulk online!